Testing for iron deficiency anaemia – Encouraging results! Serum ferritin alone is a highly sensitive test of iron deficiency in patients with otherwise good health. Iron studies (serum iron, iron binding capacity and serum transferrin) should not be ordered as initial first-line tests. Iron studies may be indicated if iron overload is suspected, or other comorbidities are known or suspected. If serum ferritin is increased (iron deficiency is unlikely with ferritin levels over 100 micrograms/L), iron studies may be requested for further investigation. Although the total number of tests to investigate anaemia have risen in New Zealand over the last four years, the proportion of these that are ferritin only tests has increased from 53% in 2010 to 68% of tests in 2013. This is a substantial increase in appropriate testing. 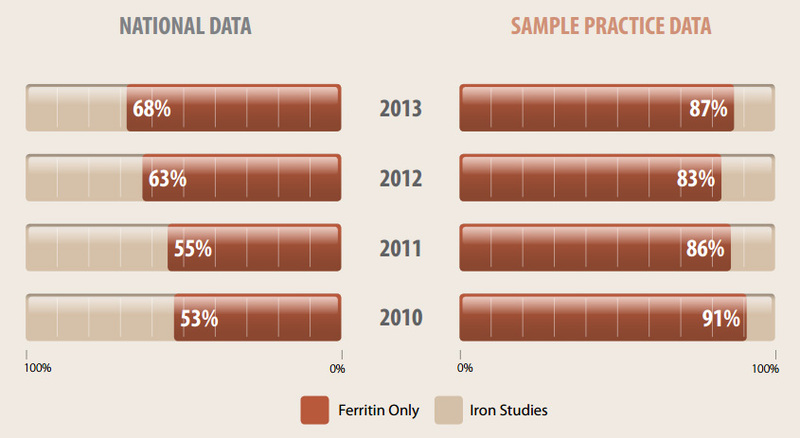 Figure 1 below shows the breakdown of anaemia testing as a percentage of ferritin only and iron studies tests that were performed nationally and for your practice population over the last four years. National Institute for Health and Care Excellence (NICE). Clinical Knowledge Summaries. Anaemia - iron deficiency. NICE; 2013. Available from: http://cks.nice.org.uk (Accessed Dec, 2013).